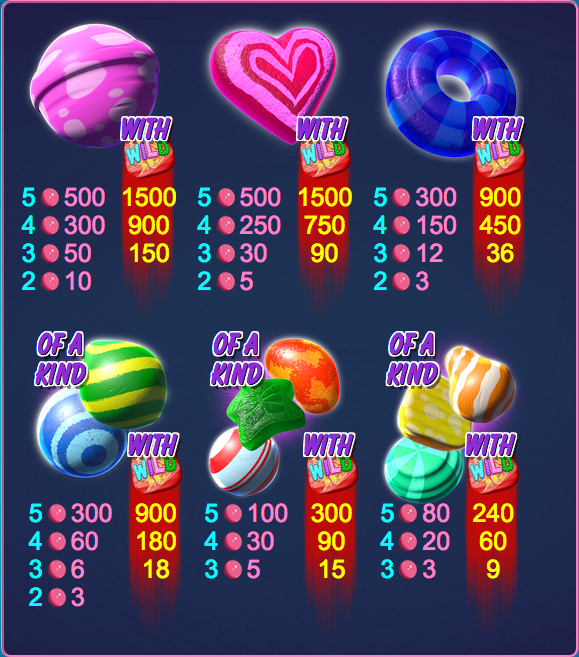 We’ve reviewed a handful of online slots based on sweets, or candy or whatever your preferred term for the tasty treats which leave us with dental problems later in life; we now have one more for your delectation, it’s called Crazy Pop, it’s developed by Games Lab and you can read all about it below. 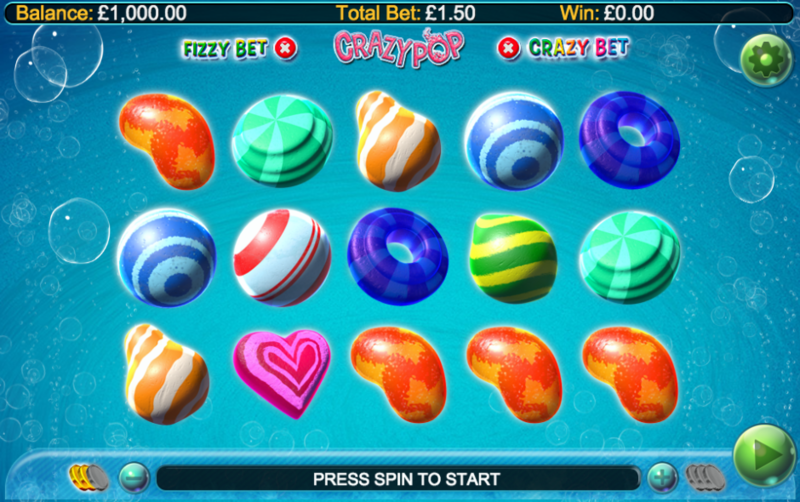 Crazy Pop is a five reel slot with three rows and fifty fixed paylines; the sugar symbols float on the reels against a backdrop which seems to place us underwater with bubbles of varying sizes drifting up towards the unseen surface. There are eleven standard tasty symbols of varying shapes and colours which you can see on the ‘Game Two’ tab above. The wild symbol is a red symbol inscribed with ‘Wild’ and it will substitute for all others to form winning combos except for the Crazy Pop scatter icon; the wild will also cover all positions on it’s reel and multiply any wins by 3x. Fizzy 6th Reel (2x stake) – adds a 6th reel which is comprised of multipliers from 1x to 20x; the actual value corresponds to where the payline ends. Crazy 6th Reel (3x stake) -adds a 6th reel which is comprised of multipliers from 2x to 100x; the actual value corresponds to where the payline ends. Super Sweet Feature – 20 free spins with up to nine extra yellow wilds added to the reels after the spin. The red wild appears only on reel three. Wild Slide Feature – 9 free spins and when the red wild appears it replicates onto one or two more reels. 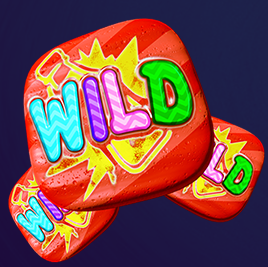 It’s Wild Feature – 7 free spins with the red wild covering the middle reel throughout. All features can be retriggered by landing three more scatters within the rounds. Crazy Pop is a great-looking slot with some lovely gameplay and plenty of bonus features and optional extras to keep things interesting; the RTP ranges from 95.08& with no extra bets up to 96.02% using the Crazy 6th Reel so there’s a small advantage to paying a bit extra.